These Four Gram Plastic Poker Chips are a Casino-Style, High-Impact Chip. 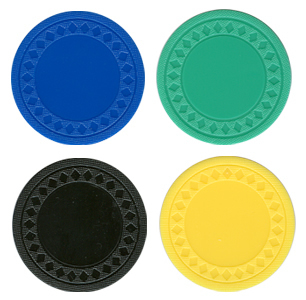 Plastic Diamond Poker Chips are available in a range of colors (see below). These are among the most economical chips available. Please note: At this time, these chips are not available custom imprinted. 4 Gram Smooth Diamond Poker Chips are available blank (non-imprinted). They come in Black, Blue, Green, and Yellow (other colors are not available). 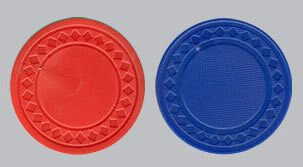 4 Gram Textured Diamond Poker Chips are available blank (non-imprinted). They come in Black, Blue, Burgundy, Gray, Green, Orange, Purple, Red, White, and Yellow.